Who is involved: Alzheimer’s Society and Alzheimer’s Scotland. Nature of activity: ‘Dementia Friends’ is an awareness-raising initiative developed by the Alzheimer’s Society. It involves a 45-minute information session given to any group of individuals who may have contact with people with dementia in the community (e.g. shop staff, public transport workers, volunteers in civil society organisations and faith communities, etc.). It provides basic information about dementia and suggests helpful responses that people can give in encounters with people with dementia. People who have participated in a Dementia Friends session (including people with dementia) can become Dementia Friends Champions and deliver the session themselves. An alternative way to become a dementia friend is to watch online videos that show the world from the point of view of someone with dementia, and are tailored to people who might interact with people with dementia in different environments. There are dementia friends’ initiatives in other UK countries. You can find out about Dementia Friends in Wales and Northern Ireland via the main Dementia Friends website and for Scotland in http://www.dementiafriendsscotland.org/. 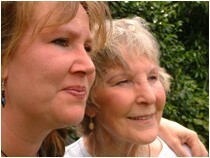 The Dementia Friends websites contain inspiring ‘dementia stories’ and videos, like Gina Shaw’s story. Gina is 61. She used to be a children’s nurse. She was only diagnosed in 2014 with dementia and is still coming to terms with it. She uses the metaphor of a couple of lightbulbs on a Christmas tree that aren’t working to explain what dementia is. For her, being around other people is all about them being kind, patient and waiting. She has family and friends who help her and “I don’t know what I would do without them”. She explains that people with dementia sometimes see things that aren’t really there, like a reflection in a mirror. The hardest thing for her was telling her children as she is their mother and wants to carry on being a good mum. Her friend has had dementia friends training. She says that if Gina seems to go off into a world of her own, as she sometimes does, she asks gently if she’s gone to the Palace (a live music venue) which is somewhere they used to enjoy going to when they were younger. Gina finishes by saying that with help people with dementia can lead a full and active life. She spearheaded a 2015 Alzheimer’s Society promotion campaign which led to establishing Dementia Friends in Australia.